Sons of Technology: RocketWindow Revolution! I recently presented at an EdTechTeam Summit, At the summit they gave away a notebook called a Rocketbook. Now I’ve heard about these Rocketbooks before but I've never actually had one, so I didn't have a chance to see what it can actually do. I started playing around with it to see what all the fuss was about. Now if you don't know what a Rocketbook is, it's a notebook where you can write traditionally with pencil and then at the very bottom of each page, there is a QR code with some tokens. 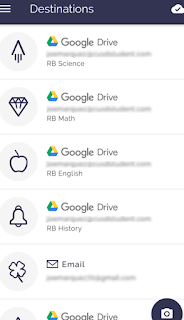 With these tokens, you can bubble them in and with the Rocketbook app it will scan the traditional written pencil and paper diagrams or notes that you are writing and can send them as a PDF or JPEG to anywhere on the internet. Well, when I say anywhere on the internet I really mean to a cloud service that has a storage such as Microsoft 365 OneDrive, Google Drive, and Dropbox. So I started doodling on the page and configuring the app to link each token to a place where I wanted to send my images/notes I was drawing. To my surprise, instantly once I scanned the image with the app, the drawings and notes that I was taking truly did port right over to my cloud service. I was amazed and then I started thinking about all the possibilities and opportunities this gave to me and my staff at my school. I know there are a lot of teachers out there who still love traditional writing. I know there are a lot of teachers out there that want to try technology but don't want to take away from a students opportunity to write in a traditional notebook-style environment. Rocketbook gives the opportunity of Blended learning to allow students to take notes the way they like best (online or traditional) and still send them over to their cloud service of their choice. These digital documents can then be turned in to Google Classroom or placed on a student portfolio to be viewed by others. This is a great opportunity to allow teachers a chance to try traditional and digital in the same setting. Blended learning at its best. Now if you know anything about me, of course, I didn't stop there. To me, developers of apps don't truly see everything their app can do. It's teachers like us that take the app and find a way to bend it, to mold it, to make it fit into our classrooms for each of our students. We hack the apps. With this mindset, I decided to hack the rocketbook. My first step was to figure out what the app was actually on the page. Was the app scanning the entire page or just the tokens? What was causing the app to fulfill its function? So I searched online for Rocketbook pages and to my surprise rocketbook the company was actually giving away free downloadable PDF pages on its website. On the blog where these Pages were available rocketbook states that it wants to give away these pages because it allows people to test out their app before actually buying a notebook. These pages entice teachers to want to use them and possibly purchase a rocketbook of their own. So I took these pages and began to manipulate them. I placed the jpg version of the Rocketsheet and placed it in Google Draw. I took a white square and placed it over the lined writing space, this making a blank rocketbook page with nothing to write on except a blank page. I wanted to test to see if this blank canvas would truly allow me to put anything in the middle and allow me to use the app and send it over to my Google Drive, and to my amazement it did. Through all this, I discovered the only thing you needed to have the rocketbook app work is a solid black border, the QR code, and the tokens. With this new information, I decided why should I stop there? If a blank Rocketpage works on a traditional 8.5 x 11 notepaper, could it work on something bigger? 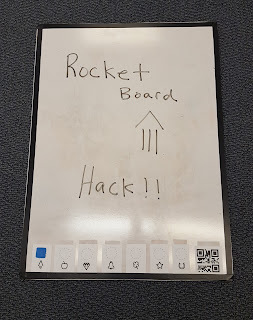 It was from this idea that the rocketboard came to be. 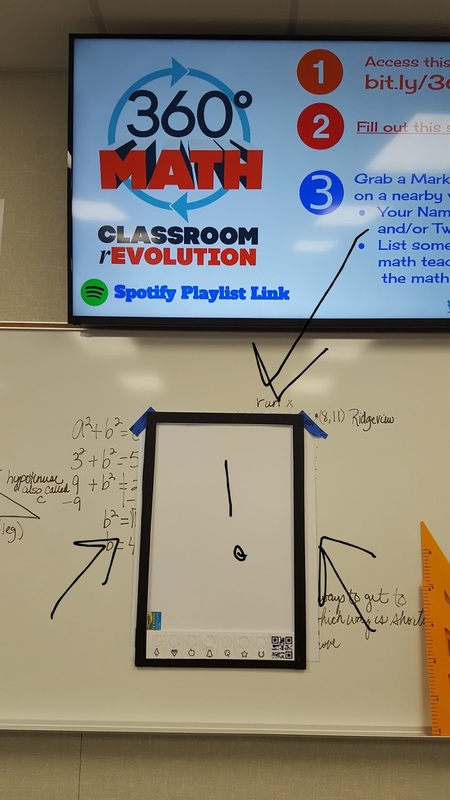 I already had large whiteboards that my students use for jigsaws and collaborative learning, so I thought if I could put a black border around the edges and then take the QR codes and enlarge them, could I turn this whiteboard into a rocketboard. I grabbed some black masking tape and taped all the edges around the Whiteboard. I took the QR code and the 7 tokens and I enlarged them up on a piece of paper and printed them. I carefully cut them out and laid them at the bottom of the black border whiteboard. I then wrote something on the whiteboard and then use the app to scan. Once again the app and hack worked flawlessly. I stood back and thought, “This it's something new. 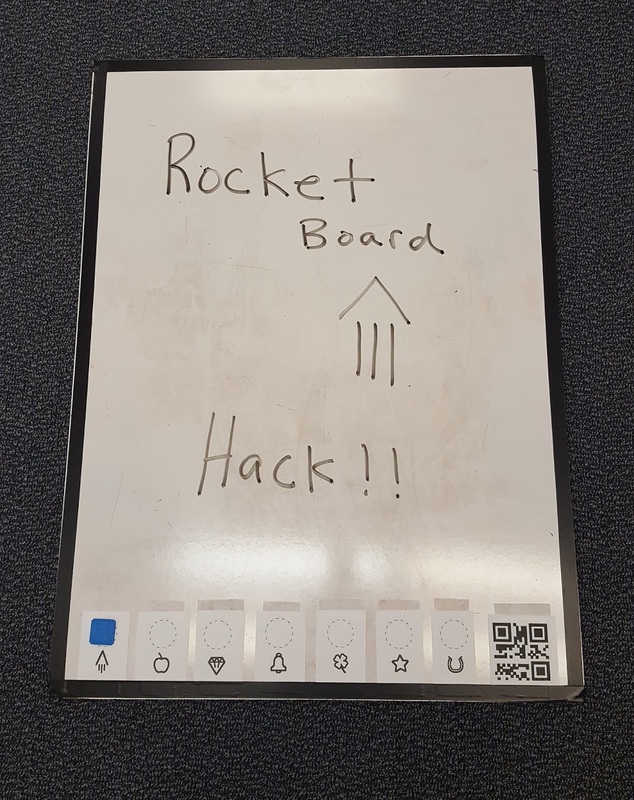 This could open up so many possibilities.” This was the rocketboard. Of course, again I couldn't stop there. How could I? You see a lot of teachers don't have whiteboards pre-cut which they can hand out to their students. Most teachers only have a large whiteboard in front of their class. What if students are doing work on that? How could we allow students to take their work and Rocket it right to their drive? I thought, if a rocketboard works, what would happen if I cut out the entire workable section out? What if I just had a black border and then at the bottom of that frame was the QR code and the tokens? What if I created a window? That's that's where the idea of a RocketWindow was born. I headed out to the office supply store and bought a 3 pack of 20 by 30 foam boards. I placed a 1 ½ inch black border around the foam board and then placed my exploded QR code and Rocket tokens at the bottom. I then carefully, with a box cutter, cut out all the white around the rocket board creating a window. To make it stay on the whiteboard I placed 4 button magnets on the back. 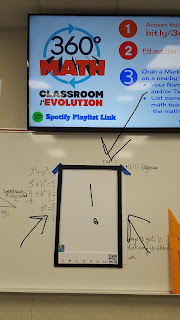 I placed the window on the classroom whiteboard, wrote in the window space, and amazingly it worked. From this board, I was left with a medium sized white cut out. I don’t like to be wasteful so I wondered what could I do with this. I measured it and found if I cut it into fourths I'm left with 4 smaller 8 x 11-inch rectangles. I thought I wonder if I could put an inch of the black border around there and they smaller printed QR code with tokens on the bottom. I wonder if that would work. I went to work and this created four RocketWindow minis. These RocketWindow minis can be placed over any student work of any paper they have in class. 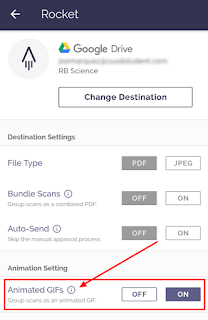 Now ANY work can be rocketed their Digital Drive and can be placed anywhere in Google Classroom to be turned in or on a website digital portfolio for later use. As you can see, by this time I was super excited! Something new out of rocketbook. Something new for a teacher to use. Something new that's beneficial to all educators! I thought wait a minute, there could be more. 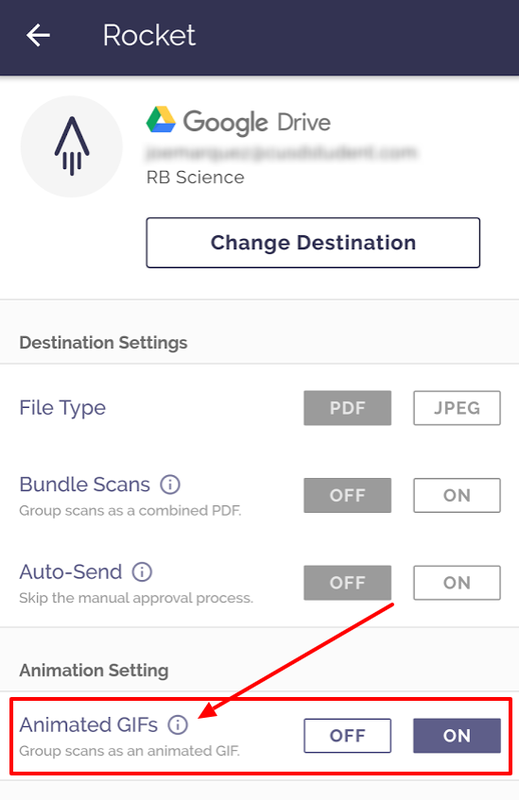 When I looked in the app there was more than just an option for a scanning the image over as a PDF or jpeg. At the very bottom of the app, it gave you the option of creating an animated gif. I thought. I wondered. Could I use this on the whiteboard by writing a small word at the top scan the image, write another word beneath it scan the image, another word scan, another word scan, and then hit send? To my amazement, it created an animated gif of my work! How awesome is this?! Now students can show their work on math on the board and have an animated gif when they turn it into you. They can write the problem at the top, step number one, step number, then rocket the animated gif to the drive of their choice, then turn it in to Google Classroom to show their work! Finally I wondered, could anything be placed in this window? Does it have to be something written? Does it have to be something with the pencil or marker? Or can a 3D object be placed in the RocketWindow? To test my theory, I placed the RocketWindow on the floor and then I placed some 3D objects within the RocketWindow. I scanned it and it worked! I thought this is a great opportunity for littles who can’t fully write yet but can manipulate objects. Thinking of them I placed some foam letters into the RocketWindow and spelled cat, it worked! I put up the RocketWindow on my whiteboard and put some magnetic letters to spell dog and it worked. And yes, the animated gif option works on this as well. How cool will it would it be to show these young students spelling out words for the first time in a step-by-step process that is scanned by you in an animated gif? How fun would it be to show this to their parents so the parents can see their child in the act of manipulating objects and spelling out words. I think this would be really cool to see in a K-2 classroom. If you're reading this blog and you try some of these ideas or if you make a rocket window and you're trying your students I would love to see it! Try using the rocket window with 360 math! Try using it on your own daily agenda you write on the boar each week. 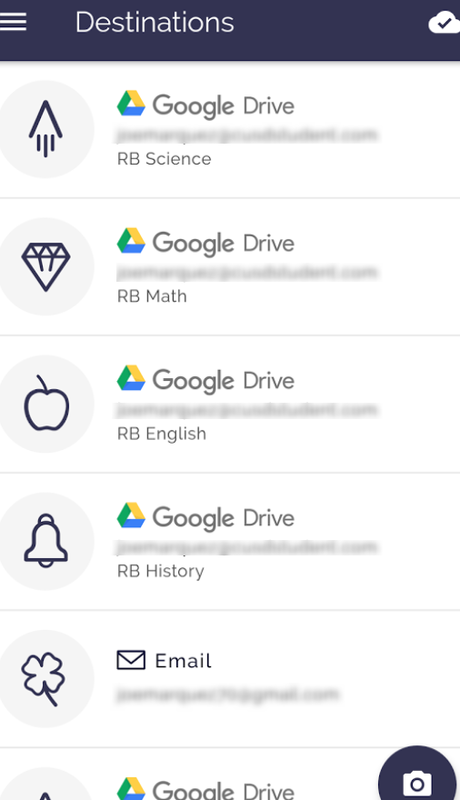 If you try anything I would love to see pictures or to hear your story about what you are doing and how you're transforming your classroom with these new RocketWindow tools. At this point, you might feel excited, but some of you might be thinking how does Rocket book feel about all this? Well, I was thinking the same thing. I was hoping they wouldn't be upset. I was hoping they wouldn't see that I'm infringing on their app. My answer came in the form of a single tweet which said “Genius. #MindBlown.” So I'll take that as their blessing. In closing I want you to remember that your classroom is unique, your students are unique, and sometimes the developers of educational technology tools don't see the true power their app can have on your students. Sometimes you have to bend the app to your will. Sometimes you have to manipulate the app to benefit your students. Sometimes you have to Hack the Apps! How to make the #RocketWindow. Watch the video, then read the instructions. On the 20x30 foam board place a 1 ½ inch black border on the top and sides. Place a 1 inch black border on the bottom. Place your enlarged QR codes and tokens just above the 1 inch black border on the bottom (make sure the tokens are laminated to allow marking and wiping of the tokens. With the box cutter, cut along the inside of the black border to create a window. On the back of your window, place one button magnet on each corner. Adhere the magnets with zots. Thanks for the great idea! I was wondering if you have experimented with different aspect ratios, e.g. a square border? I wasn't able to scan areas not having about the same format as the rocket book pages. But I'm not sure if it is actually related to the format or other things (such as QR code too small / not positioned correctly).